I've enjoyed having this set in my kitchen for several years. The base looks a bit worn and flecked already but overall it's held up. 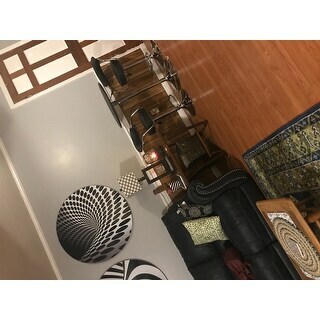 The chairs and table are wobbly if on an old wood floor. The chairs go higher than what the table can and the table goes lower than what the chairs can. This pub set from Buffalo Tools features a black, vinyl upholstery with a foam fill and a chrome finish. Sleek and simple, this three-piece set fits perfectly with any decor. The set consists of two swivel bar stools and flat-top circle table. Each of the pieces has adjustable heights, ensuring a comfortable fit for any kitchen or bar area, as well as anyone looking to rest. Both the table and stools are designed with convenient heights for binge and alcohol drinking joints. I moved into a retirement home. I have the smallest kitchen, but this set fits in my small u shape kitchen. The chairs and table are flexible I have them in the lowest setting. A person that weights 200lbs can fit comfortable at the table. It is very cozy and all my guest loves it in my kitchen. I dont have to use my dinning room table for breakfast etc, The table will work well as a pub as well if that is the use you intend it for. We ordered two of these sets for entertainment in our basement. We hosted a super bowl party and they were a hit. My husband thought the tables sat too low for chairs at first, but when he saw our guest seated at both sets they were the perfect height. They are quite comfortable and never received a complaint from any of our guest to say differently. We are looking to purchase two more sets as we have a very large basement and many family/guest during visits. I cannot believe you get this for the money you pay! This set if worth that & much more! The stools are hydraulic like, they lower with your weight when you sit which is cool. 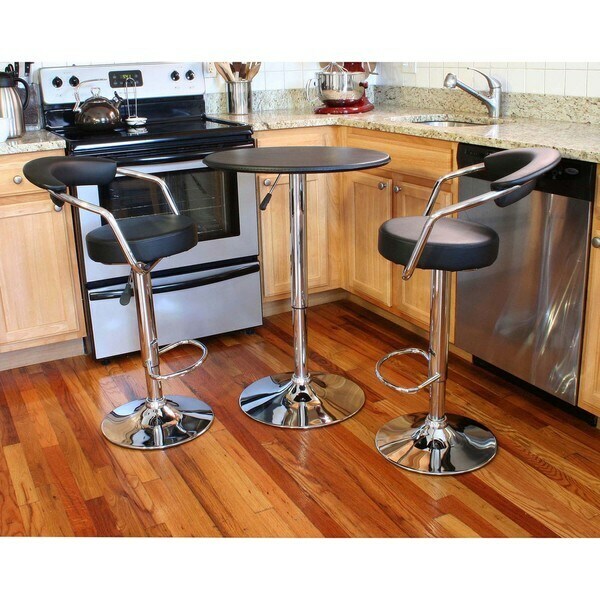 The stools AND table are adjustable which is also very cool! Very sturdy too, doesn't tip when you sit. Nice set! The table top is nice too, looks like sewn on leather or something. Nice addition to the man cave! Nice pub table for my bar...perfect size. Good looking set for the price. No problems putting it together. This is the most attractive pub set to have coffee or tea. So, so comfortable you talk for hours! I put large black decals on the wall above and looks very warm and inviting! We love this set! My 13 year old put it together with no problem. The seat cushions are thick. Table is adjustable. Quality is very good for the price. Not a $1,000 quality table, but certainly rivals the quality of a $500 table and chairs. Seat swivels 360. Fun. I wanted something different in my flat to dine on, so I ordered this. it was easy to put together even though I had a small problem getting the levers to work. I really like the looks of this Pub set. Several of my friends have asked me were I bought it and I told them. It fits perfectly in my kitchen and is beautiful!! Buyer beware....The seats are a little restrictive. I had to buy another bar stool all together...I am a 300 lb man and though I could squeeze in (Sort of) it was painful sitting. I bought a different stool for me and leave these two, to the guests........only invite your skinny friends over! As described buf smaller than I like. I liked it when I saw it on line , but when I received it I loved it. And it was easy to put together and it seems to me, to be of good quality ! Also I have a small kitchen and it fit in there very easily. This came quickly and was beyond easy to put together. Adorable and well made for this price! Fine for the price. Good service from company as here fast. "Is the table top supposed to spin around or did I not assemble correctly? Thanks." According to the description, the chairs swivel and the table adjusts to the needed height. Price with multi height use of the table is a good bargain. "Can I purchase additional stools without purchasing another table?" Hello ladypink719, Yes, please see item 12744245. Thanks for shopping with us. "How much weight can these stools handle?" Hi kbalogh, thank you for your inquiry. Unfortunately Overstock does not weight test our items; typically this type of stool holds up to 200-250 pounds. We hope this helps. Thanks for shopping with us.